The most common reason why women turn to weight gainers is that they just can’t seem to put on weight even if they eat and eat. While there are some who think that this is a “blessing”, being unable to achieve a normal body mass index (BMI) is actually unhealthy and feels more like a curse. Whether you have a fast metabolism or you’re just naturally petite, weight gainers can help you achieve your goal weight without resorting to extreme diets and severe muscle exercises. To help you choose the best weight gainer for women, here is a list of our top five picks. Nature’s Best Isopure Mass not only contains high levels of calories, whey protein, and carbohydrates, but also BCAAs and L-Glutamine, an amino acid that also fortifies the immune system. It doesn’t have any lactose or gluten, which makes it suitable for those with lactose-intolerance and vegetarians. This whey protein powder is packed with 120 calories and 24 grams of high-quality protein per serving. Backed with its Optimum Nutrition seal, you can be sure that it is made from premium ingredients. Whether you’re looking for a good post-workout fix or an effective weight gain drink to take between meals, this whey protein powder is a good place to start. The BSN True Mass features a standout protein and carbohydrate content with its 4:1 ratio. It also showcases a unique formula of various proteins consisting of whey protein isolate, calcium caseinate, and casein protein, among others. 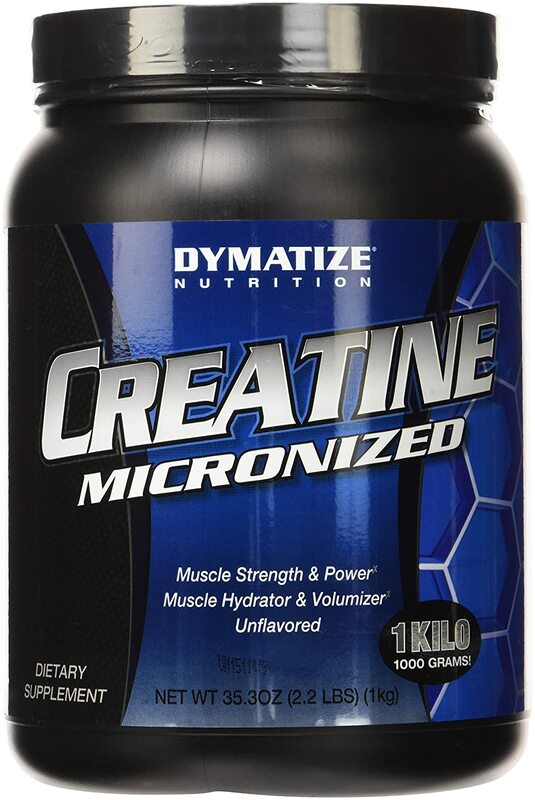 Designed to not only increase muscle mass but also to restore tired muscles after a workout, the Dymatize Pure Grade Creatine is currently one of the most popular creatine formula. Unlike most creatine brands, this does not cause water retention. This weight gainer contains the most number of essential amino acids compared to the other brands on this list. It also features a special sustained-release formula, which makes its contents stay longer in the body. 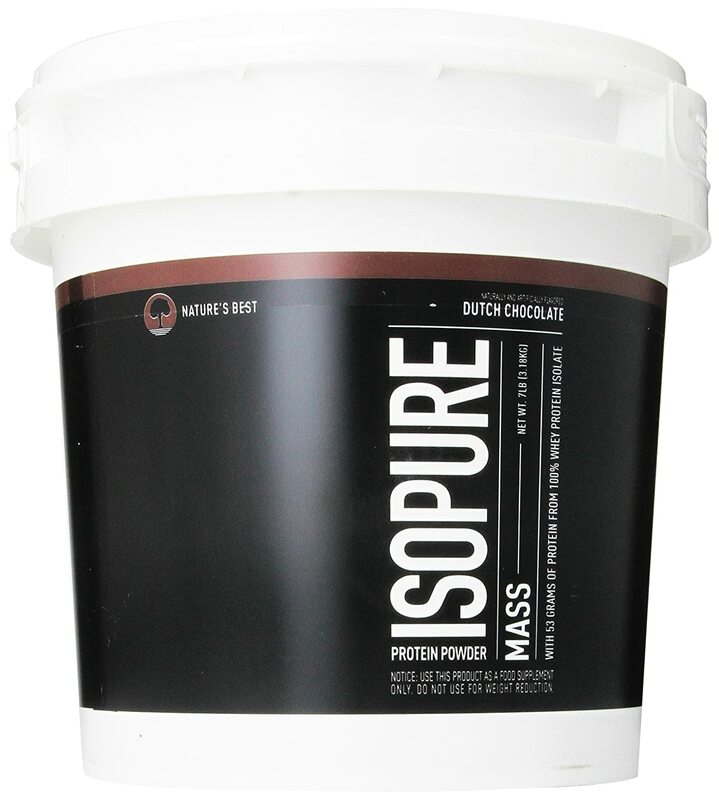 The Isopure Mass boasts of its “fully loaded” formulation. Packed with 600 calories, 86 grams of carbohydrates, and 53 grams of pure whey protein isolate, this really delivers its promise. It also contains 11.5 grams of BCAAs and 4.9 grams of L-Glutamine, an amino acid that also boosts the immune system. If you are lactose-intolerant or a vegetarian, then you might want to start with this as it contains no lactose and gluten. It also comes in an easy-to-mix formula so you can blend conveniently. It’s also light on the stomach and doesn’t cause any bloating unlike lactose-based weight gainers. Optimum Nutrition is known for their best-selling health supplements and this whey protein powder doesn’t disappoint. Currently the most reviewed weight gainer in Amazon with 4.5 stars rating, each scoop contains 120 calories, 24 grams of all-whey protein, 5.5 grams of BCAAs, and 3 grams of carbohydrates – and that’s just for one serving. If you have picky taste buds, worry not as there are twenty flavors to choose from. This weight gainer also contains enzyme additives to ease digestion. However, if you are lactose-intolerant, you might want to skip this as it has milk and soy. 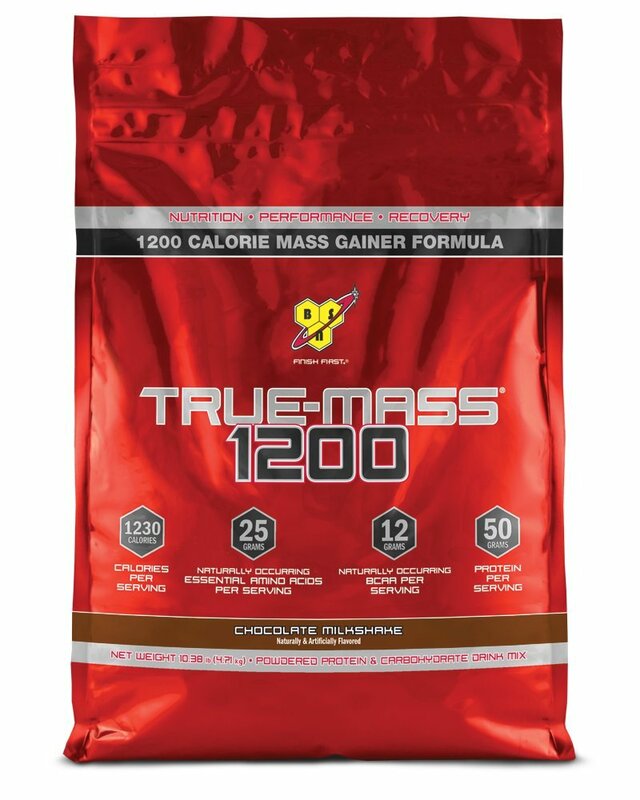 The BSN True Mass 1200 features 215 grams of special carbohydrate blend that incorporates whole oats, which is a good source of dietary fiber. Its signature formula also contains 50 grams of whey protein concentrate and 12 grams of BCAAs, along with added unsaturated fats. This weight gainer can also be taken after workout, between meals, or even before bedtime, as it does not contain any caffeine. It also contains a relatively lower amount of sugar, with only 16 grams per serving. This also has one of the highest protein to carbs ratio among weight gainer brands right now, with a 4:1 protein to carbohydrates ratio. It also has one of the cheapest per pound price. The Dymatize Creatine is packed with 1,280 calories and 252 grams of carbohydrates. One serving contains 52 grams of protein and 17 grams of BCAAs. It uses only pure creatine monohydrate, a substance necessary in energy production. Unlike the other weight gain supplements on this list, you won’t have to drink several scoops of creatine to load up, which means that it lasts longer than the other weight gainer brands. You just have to make sure that you take it every day. Most creatine products tend to affect the body’s water retention, which can cause bloating. However, the Dymatize Creatine does away with this as there are no fillers used, so you can be sure that what you’re getting is pure. Aside from developing muscles, this can also be used for post-workout recovery. The only downside to this is its dissolvability. It takes too long to be mixed and may sometimes form clumps at the bottom of the protein shaker. 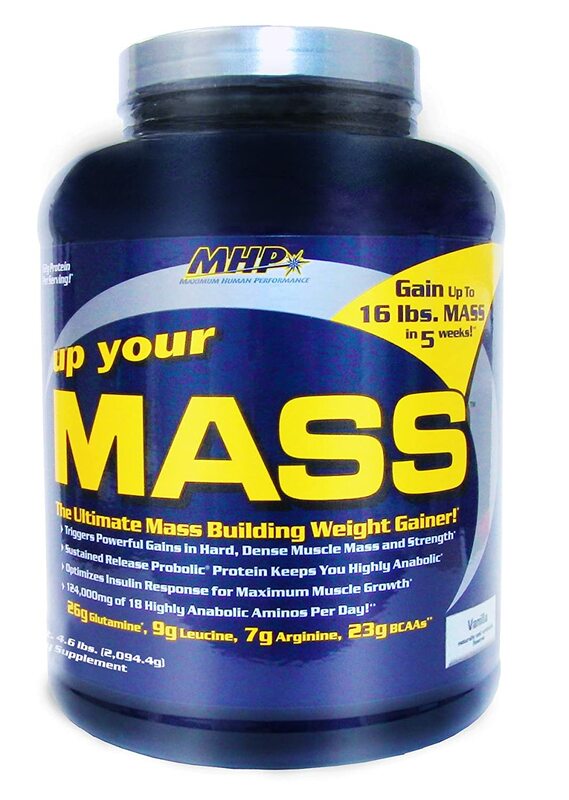 The MHP Up Your Mass Weight Gainer is a strong competitor. It contains 124 grams of amino acids that help stimulate muscle-building. It also has 26 grams of glutamine, 9 grams of leucine, and 7 grams of arginine, and 23 grams of BCAAs – the main amino acids involved in the body’s protein synthesis. Aside from increasing muscle mass, this also enhances appetite, so achieving your goal weight can be easier and faster. The MHP Weight Gainer also features sustained-release proteins so its formula stays in your body throughout the day. We want to help you understand your body’s needs so you could choose the weight gainer that best suits you. If you’re still undecided whether to start taking a weight gain supplement or not, here are three important reasons why you should use a weight gainer. Calories are the stuff that makes you gain weight. Thus, it is important to know the amount of calories that you need per day. According to the American College of Sports Medicine, the average caloric intake for women should not fall below 1,200 a day. Calorie requirements also vary according to age. For women between 19 and 30 years old, the average requirement is 2,000 to 2,200 calories a day. On the other hand, women aged 31 to 50 years old need a minimum of 2,000 calories per day while those older than 50 years require about 1,800. Most weight gain supplements contain a thousand calories in every pack. With regular intake, you could easily achieve your minimum calorie requirement. Most people confuse gaining weight with getting fat but this is not necessarily the case. Sure, you will gain weight when you get fat but there is a healthier and leaner way to increase your body mass. Weight gainers are packed with specially formulated fats. This particular type of fat keeps you lean while also promoting your body’s muscle-building process. Additionally, it is recommended to choose weight gainers that contain the least amount of saturated fat, as this is the kind of fat that increases “bad” cholesterol. Creatine is one of the chemicals required to create adenosine triphosphate (ATP). ATP is the substance that provides energy for the cells. Research has shown that taking creatine supplements may enhance physical strength and quickens muscle recovery, so it is no wonder why it is very popular among athletes and gym buffs. The additional creatine provided by weight gainers is another reason for you to take it since gaining weight requires both diet AND exercise. Creatine gives you more energy and helps you last longer during workout sessions. It also speeds up muscle recovery, allowing you to hit the gym more frequently so you could build more muscles, which increases your weight. Creatine is usually sold separately but there are available products that combine creatine with protein shakes or meal replacements so you could hit a few birds with one stone. A crucial tip in making any purchase is to first understand what you are buying. In choosing the right weight gainer for you, you should know the breakdown of the key ingredients and their functions so you could make the most of your weight gainer. Protein is the main building block of muscles. As you build muscles, your total mass also increases. The recommended protein intake for women is 46 grams daily, and weight gainers usually contain 50 grams of protein in each serving. Carbohydrates are the body’s primary source of calories. To gain weight, an average woman needs to eat more than 2,000 calories per day. Weight gainers also contain ingredients that don’t necessarily make you gain weight but they help in maintaining metabolism, such as vitamins and minerals. Most brands also include branched-chain amino acids or BCAAs. This kind of amino acids provide energy. According to the Journal of the International Society of Sports Nutrition, BCAAs stimulate protein synthesis to develop muscles, which increases your weight. In terms of muscle bulk and overall body mass increase, the weight gainers on this list have almost similar features. 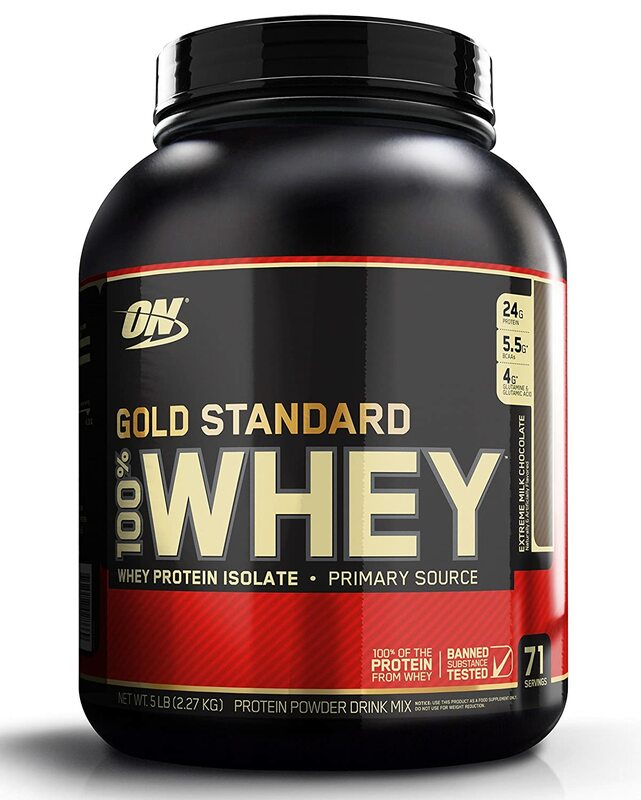 However, comparing each product’s benefits versus bang for your buck, the Optimum Nutrition Gold Standard 100% Whey Protein Powder emerges as the best weight gainer for women. Each serving is packed with high concentrations of protein, calories, and BCAAs, which are key components in creating new muscle tissues and increasing overall body weight. It also features enzyme additives which help with digestion, which is a big plus as whey protein powders are usually strong and may upset sensitive stomachs.